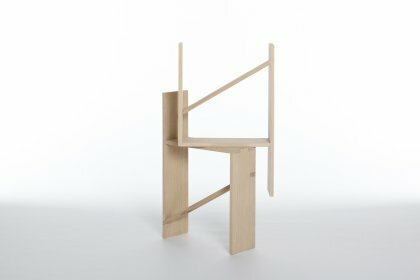 Our ideas of the archetypical chair are primarily influenced by two or more fixed determinants: one is the configuration of a step-like construction, consisting of a table-like surface plus a "wall", towering about twice as high above one side of this surface and functioning as a backrest. The other is the proportions of this composition. As for the configuration, Chair 4ty5ty by Christian Klotz completely meets our expectations: the backrest and seat quite accurately correspond to the model described above. The proportions, however, do not, as Klotz trims both seat and backrest to an extreme minimum. In spite of this, the chair works perfectly. It may not meet our expectations for comfort, but as a piece of furniture, as a "tool" for a hasty sit-down, it is ideal. You could even say that it defines a very contemporary idea of sitting.